Jesus is spending his last hours with his disciples. In the morning he will be arrested and, soon after, crucified. Jesus needs to leave his disciples with something that will unify them after he has left. Indeed, something that will unify all his followers for all time. He leaves them with the first Eucharist, that symbolic act in which the participant partakes of the essence of Jesus as spiritual nourishment and that would serve as the core of many Christian worship services for the following two thousand years. The hexagram contains the image of Lake above Earth. Water unites in a lake, and a lake is most naturally found above the earth. The hexagram also consists of two strong lines in the fourth and fifth positions, uniting the weak lines below. There is only one more weak line to unite, that in the top position, so the unification is still in progress but almost complete. This hexagram is in contrast to the hexagram for archetype 8 (Holding Together). 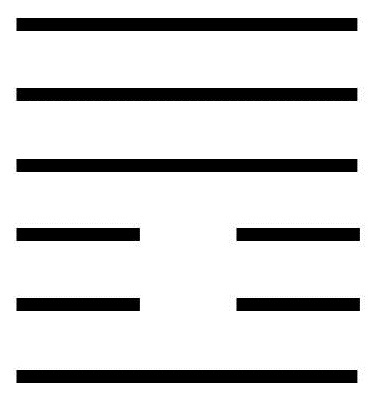 In that hexagram, there is only a single strong line uniting the weak lines. Now there are two, so the unity is stronger. To unite people into a single group, such as a family, a community, or a state. To nurture spiritual traditions that bind the group together over time. To identify the central figure of the group. To be sure the central figure of the group is one who is grounded in Wisdom. To leverage the unity to create great things. To take steps to ward off the internal strife that develops in even the closest groups. To prepare for the unexpected. A moving line in the bottom position describes the indecision that can accompany the choosing of a group leader. A large group is easily influenced and thus wavers in its decision. But without a leadership decision being made, there is no central core to stabilize the group. The solution is found in discernment and in group prayer. The leader will emerge naturally, and it will be clear to all that the right one has been found. Once this happens, all should support the newly called leader. A moving line in the second position warns that this is not the time for arbitrary choices. Wisdom is quietly at work, bringing the appropriate people together and creating the necessary relationships. We must give her time to work and follow her lead. A moving line in the third position describes the predicament of one wanting to be part of the group but not able to break in from the outside. The group is already united, and the outsider feels isolated. The best thing for the outsider to do is to find an ally who is closer to the center of the group. This ally can help the outsider gain acceptance. No one likes being an outsider, but the outsider can take heart knowing there is a way in. A moving line in the fourth position describes one who unites in the name of one who is even greater. The uniter is not seeking personal advantage, but is working unselfishly for the greater good. This bodes well for success. A moving line in the fifth position reminds us that not everybody who gathers around the center of the group does so for the right reasons. Some do so because they want to be close to the center of power. How do we deal with such people? This line recommends not confronting these people, but gaining their confidence. The way to gain their confidence is for the leader to be absolutely and unswervingly devoted to the goals of the group. Eventually these people will see the Wisdom the leader embodies, and their hearts will be won over. A moving line in the top position describes one who wants to be united, but whose intentions are misunderstood. This causes great sadness and misery. But this sadness may be a blessing in disguise, because it can catch the attention of those who have been dismissive. They now see the pain they have caused and reach out to the rejected one. Thus the pain becomes a catalyst for greater unity.